Raleigh Street Bakery operates under Colorado’s cottage food law. This means you can purchase delicious artisan bread, directly from me, your neighbor. 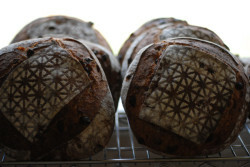 All of the breads are naturally leavened and made with organic ingredients. Every loaf is hand mixed, hand shaped and then baked in my home wood and gas burning hearth oven. You can preorder our bread through our share program and pick it up on Fridays at the bakery from 10 am to 6 pm and on Mondays at Call to Arms Brewing Company from 4 to 7 pm. Follow this link to the share form to sign up! Made with organic white, whole wheat, and whole rye flours, this crusty bread makes a perfect accompaniment to all your meals. With its mild sweetness and chewy crust, this hearty organic loaf will make you love wheat bread. 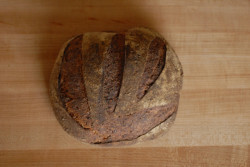 A dense, German style, organic whole grain rye bread. Made with toasted sunflower seeds and caraway. I love making sandwiches with Raleigh Street Bread... PB&J for the kid in me and then obviously salami, pepperoni, and cheese for the Italian in me. I eat Dave's bread by warming up the whole loaf and tearing it off piece by piece until it's gone. 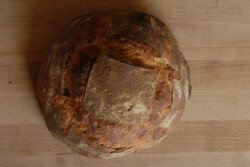 Raleigh St. Bakery brings bread back to it's roots: delicious, simple, and local. Dave's bread is the best bread. Once you try it, you'll know.